Apart from all the philosophical differences (when comparing with open source licenses etc), Nero is an extremely powerful CD/DVD burning suite that’s widely used by millions of users worldwide. You can install it easily in Ubuntu if you like too. It ain’t free, but they do give you a trial period. Nero also has a proprietary disc image format of its own called “nrg” but some CD/DVD burning tools don’t support it. So if you’ve switched to a different disc burning utility recently, then you might have to convert them into something else before you can burn them. In that case, if you’re using Windows, then you can use a simple tool like “Nrg2Iso” to converts the Nero proprietary “nrg” images into the standard “iso” format and it is recognized by all the CD/DVD burning tools. “Nrg2Iso” is a completely free, fully open-source (GNU GPL licensed) very simple tool that requires very little of your system resources to run. *. 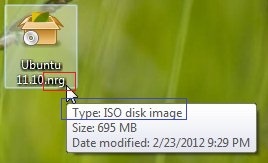 Convert “nrg” images into the “iso” format. *. Shows a progress bar. *. Does not support drag-n-drop, so you’ll have to use the “Browse” button while loading files (nothing biggie though, right? :D). *. Also has a command-line version, if you wanna live up to it 🙂 (it has it’s uses). The command-line version it’s a bit hectic to use when compared with the default GUI, but the command-line version is easily portable. The converted file is also saved in the same directory where the source file is located. It seems like a little bug as it still adds the “.nrg” extension to the output file, but it’s actually an ISO disc image which can be confirmed when you move your mouse pointer over the converted image. The reason I mentioned this was because, usually in Windows an extension plays somewhat a major role and if the extension is a popular one then the it is hidden by default. So for the naked eye, as in this instance, the output file might look like a Nero image, but of course it’s not :). Anyway, if interested, you can get it from this “Nrg2Iso” home page. How to Make Foxit Reader Work in Ubuntu 12.04 & 11.10 Oneiric Ocelot?